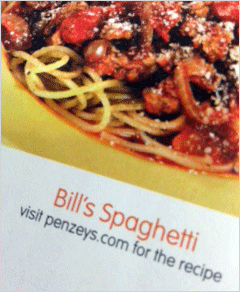 I love the Penzeys Spices catalog, and I know I know I am not alone. It is a wealth of just about anything you have ever wanted to know about spices, it has amazing recipes that are sent in by customers so you know that they’ve been tested on friends and family – and sometimes handed down generation to generation. Each issue has stories about different people’s lives and their passions and relationships with family, with community, with food. I feel like I know Bill, the owner of Penzeys Spices, who believes that the way to a better world is all about community and it’s all about love. In each catalog, Bill writes personal columns about his thoughts, his dreams, his family – pictures of his kids and their artwork. His catalogs are pored over, recipes are torn out, I have seen posts of people searching for recipes from catalogs years past (because I was doing the same thing! –the most fabulous apple cake you have ever tasted). Penzeys sends out 9 catalogs a year – and usually they have a paper wrapping with a coupon for a free bottle of a new spice or a seasonal spice. Definitely has gotten me to make the trek to their store – where I can’t stop myself from picking up a few other spices while I’m there. The current catalog has a coupon for roasted garlic – but, for me, it came with even more exciting news. Why would he do that now that his website is so much more user friendly? He could save so much money by not sending out those printed catalogs – right? He could just send the coupons through an email newsletter – right? WRONG!!! What he is going to do is what every smart retailer knows – he’s going to use all of these different methods to ultimately increase his reach, increase his community, increase the love, and increase sales. A recent study by ATG found that 78% of consumers said they use catalogs to browse and discover products. In other words, without a printed catalog a spice shopper is only going to buy the spice they know they need. Browsing through the printed catalog, they are going to come up with a few more that they didn’t even know they needed – and feel connected to the Penzeys community, brand, and message. It turns out there is even a name for this hybrid type of catalog that is full of stories and information – it’s a magalog! It turns out that he is planning to stop putting the paper coupon on the printed catalogs – which will cut down his mailing and printing costs. Instead, he is going to send out more coupons using an email newsletter which means more treks to the store or more visits to the website. Again – using the strengths of each type of media to realize the company’s dreams and goals. This entry was posted in Concept, Design, Mail, Marketing, Print and tagged goals, Marketing, marketing materials, out of the box, promotional. Bookmark the permalink.